Sometime before June 250 C.E., a commission was sent to central Egypt to ensure compliance in the offering of proper sacrifices to the Roman gods for the well being of the new Emperor Trajan Decius, who had become emperor a year earlier. 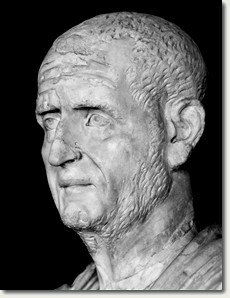 In January 250*, Decius had issued an edict that all those who were living in the empire would be required to offer appropriate sacrifices, witnessed by their local civic magistrates, for the well being of the empire. The requirement included: the offering of a sacrifice to the traditional god(s), the pouring of a liquid libation and the eating (tasting) of the sacrificial meat. Failure to participate was viewed as an offence against the state and could be punishable by death. Uniting the Empire or Destroying Christianity? To the Superintendents of offerings and sacrifices at the city from Aurelius […. ]thion, son of Theodorus and Pantonymis, of the said city. It has always been my custom to make sacrifices and libations to the gods and now also I have, in your presence, in accordance with the command, poured libations, sacrificed and tasted the offerings, together with my son Aurelius Dioscorus and my daughter Aurelia Lias. I therefore request you to certify my statement. The 1st year of the Emperor Caesar Gaius Messius Quintus Trajanus Decius Pius Felix Augustus, Pauni 20 (June 14th). On the same day, another libellus (P. Ryl. 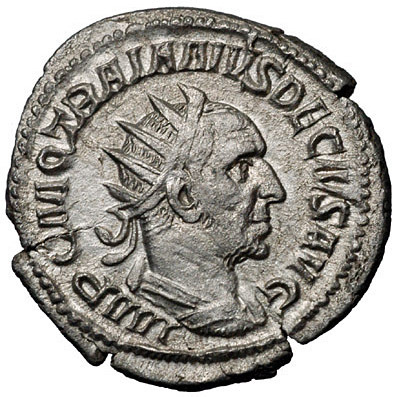 12) was issued for Aurelia Demos (without father – possibly illegitmate) in the quarter of Helleneum. As she was illiterate the statement was written by her husband Aurelius Irenaeus. One week later (June 21st), another women, Bellias, accompanied by her daughter Kapinis, offered the statutory sacrifices in the village of Theadelphia. The sacrifice was witnessed by two attending officials, Serenus and Hermas. The large lettering of Hermas’ untutored hand (reminiscent of Paul’s reference to his handwriting; Gal 6:11) can clearly be seen on the certificate (P. Mich. inv. 263), pictured right and also here with Arthur Verhoogt’s notes (scroll down to pp.10-11). Of the four surviving copies of libelli found at Oxyrhynchus Grenfell and Hunt refer to two more that are associated with the neighbouring town/city of Fayûm. They all appear to share a number of similarities suggesting that they cohere to a standard (perhaps even nation-wide) form. Grenfell and Hunt (1904:50) also note that the libelli are evidence that, as we have seen, women were also included in the Decian Edict, observing that other examples also include references to women and the naming of wives. This throws interesting light on the place of women within the the religious and state institutions. P.Oxy xii. 1464 even appears to suggest that sacrifices could be made in proxy of others. Other libelli (also from the Egypt) include notification of sacrifices made by an eleven year old boy, Aunes, identifiable by “a scar on my right elbow” on the 4th June 250 (Horsley, 1982:180-181) and Aurelia Ammonus, daughter of Mystus and pagan priestess of the crocodile god Petesouchos (Knipfing, 1987:214). Although failure to comply was punishable by death, it is unknown how rigorously checks were made concerning the ownership of these certificates. Nevertheless, the edict was taken seriously, with a number of Christian leaders refusing to comply and subsequently being executed. Cyprian, the bishop of Carthage, famously went into hiding – an act viewed by other church leaders as cowardice. Moreover, Frend (1984) notes that, at Carthage, so many Christians sought libelli that the authorities were overwhelmed and were told to return the next day! Images of the Oxyrhnchus libelli are copyright to the Egyptian Exploration Society. However, a good quality image of P.Oxy. LVII 3929 can be found here. Grenfell, B.P. and Hunt, A.S. (1904) The Oxyrhynchus Papyri Part IV. London: Egyptian Exploration Society. Horsley, G.H.R. (1982) New Documents Illustrating Early Christianity: A Review of the Greek Inscriptions and Papyri Published in 1977. Vol 2. Northride: Macquarie University. Knipfing, J.R. (1987) ‘Libelli of the Persecution of Decius 250′. In. Stevenson, J. and Frend, W.H.C. (eds.) A New Eusebius: Documents Illustrating the History of the Church to AD 337. (1987) London: SPCK. Williams, T.B. (2012) Persecution in 1 Peter: Differentiating and Contextualizing Early Christian Suffering. Leiden: Brill. Very interesting glance at the past and the practices of Rome.